What tripod should I buy for my SLR? You should get a Gitzo carbon fiber tripod. They are absolutely great and will last forever. I don’t have $600 for a legset, I only have $200 for the tripod and head. Then you should buy a simple sturdy aluminum tripod like the Bogen 3021. I should have mentioned, I want to use this tripod hiking for nature photography. Those aluminum tripods are too heavy. Then you are out of luck. Cheap/light/goodgood, you get to pick two. But are you really out of luck? The above conversation is correct. The Gitzo tripods are the class of the industry. They are well designed, last forever, and are crazy sturdy compared to their weight. But they are also pretty expensive, there is no getting around that. The Bogen aluminum tripods are a great value, are tough as nails, and are sturdier than most people will ever need. But they are pretty heavy and don’t tend to collapse down very small. Plus, that aluminum is cold on winter days. So what other options are there? Tiny travel tripods like the Cullman may be sturdy, but they are really small. The $19 cheap-o from Meglomart may be light and tall, but they sway with even the slightest breeze and shudder if you so much as brush up against them. Enter the clones. Like every industry, photography has it’s share of companies making what many call “non-OEM” (OEM = Original Equipment Manufacturer) accessories. These may be batteries or flashes or in this case tripods. These non-OEM accessories are significantly cheaper than their official counterparts. The trade off being, of course, that you have no real way to know the quality of what you are buying or even if it will work with your camera. What’s worse, if built incorrectly, something like a battery or a flash could actually do serious damage to your camera body. Due to this possibility, many companies say that using non-OEM accessories may void your warranty. Now, in practice, I can’t say that I have heard a great upwelling of anger about ruined cameras from non-OEM batteries. However, given that a vast majority of these accessories are sold through nameless ebay sellers or unknown websites, the greater risk is that you will get a product that breaks a few months down the road. Have you ever tried to get your money back from an Ebay seller three months down the road? Good luck. This is where Adorama comes in. Adorama has partnered with one of the non-OEM companies to distribute accessories under the Adorama “Flashpoint” brand. Though there are a couple different manufacturers for this stuff, the Flashpoint products are essentially the same that you see elsewhere. The difference is that you have a company like Adorama standing behind the products with phone numbers and customer service people you can call if you have a problem. As a specific example, Adorama stands behind these Flashpoint tripods with a 5 year warranty. That is something you are never going to find on ebay or with some back-alley website. This is where we rejoin our mythical tripod seeking friend. One of the products in Adorama’s Flashpoint line is a series of four carbon fiber tripods ranging in price from $153-330 and supporting 9.9-26 lbs. The tripods are obviously modeled after the Gitzo Mountaineer series of tripods, even down to using paint that resembles the familiar black/silver speckled Gitzo paint. While the Flashpoint tripods don’t give you the same quality as their Gitzo brethren, they are also $4-500 cheaper. “Okay” you say, “So I shouldn’t compare the Flashpoint to the Gitzos. But how do the Flashpoint tripods compare to a well liked tripod in their price range, like the ”http://www.adorama.com/BG055XB.html?kbid=3925">Bogen 3021/055XB?" Now that is a very good question. What do you get for your ~$160 when you buy budget carbon fiber vs buying aluminum? The tripod that I tried out is the Flashpoint 1128. It is sized for your average SLR user. Priced at $153, it will support 9.9 lbs and weighs 2.64 lbs. The closest Bogen aluminum model in price/size/load-limit would be the 055XB. Priced at $165, the 055XB supports 15.4 lbs and weighs 5.1 lbs. There is a slightly cheaper three section Bogen aluminum that would also compare to the 1128, but when at all possible one should compare tripods with the same number of leg sections. In either case, notes and reviews on the 055XB (or older 3011/3021) should be useful for other similar aluminum tripods. The Flashpoint 1128 is a pretty good looking tripod. This is in part because it copies some of the design and styling from another good looking tripod, as already mentioned. But since we’ve already acknowledged that fully, it’s not exactly wrong to say that the 1128 is pretty good looking in it’s own right. The cheesy looking “Flashpoint” logo screen-printed on one leg is just about the only thing that detracts from the 1128’s appearance. The legs have the usual carbon fiber “swirl” to them and are all fairly strong feeling with less flex that I would expect out of each individual section. That is, all except for the smallest section with is pretty thin and pretty flexy when you try to bend it. Interestingly, unlike the more expensive Gitzo (and heavier Bogen), the 1128’s feet offer screw out spikes for outdoor use. This is a useful feature that I’m always surprised to see tripod companies ignore. Also unlike the Gitzo, the center column is aluminum, not carbon fiber. A cost cutting measure I suppose. Also probably ads a slight amount of weight compared to a CF column, though you can unscrew the bottom half of the 1128’s column and cut the size in half if you are really counting your ounces. As with most good tripods, the 1128 has a hook on the underside of the center column for hanging a weight for extra stability. While this can be a lifesaver in some situations, it is worth mentioning that you don’t want o add so much “stabilizer” weight that you go over the tripod’s weight limit. Finally, there is a small bubble level on the 1128’s collar that appears to be fairly accurate. I was also a little pleased to see that the 1128 came with a cordura carrying bag. It’s not the fanciest, but it does the job and it’s always nice to see extras like that included. Compared to a more expensive CF tripod like a Gitzo, the Flashpoint 1128 doesn’t have the most rock solid feel to it. But once you start using it, you realize that there is more quality here than you might expect. While all isn’t perfect, I highly doubt that the average person is going to stand around saying “this feels like a dime store tripod”. In fact, overall, I would have to say that the 1128’s quality well exceeds it’s price point. The leg locks appear to work well, though I haven’t had time to take the tripod into dirty/dusty situations to see how they hold up after some gunk gets in there. For now though, I’m happy with them. There are three easily adjusted leg angle options. You just pull out the stop, change the leg angle, then click the stop back in again. Seems to work very well. If there is one real drawback to the 1128’s operation and design, it would have to be the system for adjusting and tightening the center column extension. When trying to raise the center column while a camera is attached, the split between the two sections of the column seems to get stuck on some part of the compression collar. To overcome this, if I want to raise the center column all the way, I take the camera off, raise the column, then put the camera back on. This could be considered slightly annoying. Also, the compression collar itself doesn’t seem to work as well as I would hope. It really seems like you have to crank down on it to get things tightened. And that sort of thing always makes me worry that I’m cross-threading something. However, I myself don’t see these as huge issues. For one thing, I’m not a tall guy, so I rarely use the center column. For the rare times when I do need the column, I’m perfectly capable of taking the camera off, raising the column, then putting the camera back on. That having been said, this isn’t the sort of problem that you would expect to have (or be willing to put up with) in a higher price point tripod. With an normal SLR/Lens load, the Flashpoint 1128 is fairly stable for general photography purposes. However, the 1128 does have more leg flex and vibration that I would like when all four sections are extended. I have a feeling that long exposures in windy environments might be troublesome. That having been said, if you close up the lower spindly leg section, vibration and flex is improved by a huge amount. In fact, that is how I use this tripod most of the time, and to be fair, it is something that plagues a lot of tripods. Especially those in lower price ranges. Still, if you are looking for a tripod to take up into the stormy mountains, you might want to test things out before you take off on your once in a lifetime trip. The individual leg sections are strong and don’t flex more than I find acceptable for a $160 tripod when you test them with your hands, but anyone who is honest will tell you that they don’t compare to the stiffness of the higher end CF tripods. Still, the stability of the 1128 was enough for my SLR photography needs, which is all I was looking for. In general, the Bogen is a more stable platform. Tapping each of the tripods on the ‘shoulder’ transmits much more vibration to the Flashpoint than to the Bogen. However, I was surprised when tapping on one of the legs to see more leg vibration that I would have thought in the Bogen. The Flashpoint had more vibration in this situation and it lasted longer before calming, but only by a little bit. The Flashpoint packs up much smaller in length and obviously weighs more. Though the Bogen makes up for this by having a taller maximum height, both with and without the center column extended. Like the Flashpoint, you can also remove a center column section to save a little weight if you wish. One small thing that people forget (and some people don’t care about) is that aluminum is cold. Very cold. If you are out hiking to shoot in the winter, your hands are going to get a serious chill when touching the Bogen’s legs. Carbon fiber doesn’t have this problem nearly as much. Overall the obvious comparison is that you get a little more height and stability with the aluminum Bogen in trade for significantly more weight and size. Adorama sent over their Flashpoint F-1 ball head to go with the 1128. The f-1 is a magnesium alloy ball head that weighs 11.6 oz, supports 8.8 lbs and is priced at $50. In terms of finding a small ball head to match to a lightweight tripod, i think the F-1 is a good value and makes a good combo with the 1128. Do keep in mind that the F-1 has a lower weight rating than the 1128 does. So if you are using the full 9.9 lb capacity of the 1128, you are going to want to step up to a larger ball head such as the Flashpoint F-2 (supports 11 lbs, weighs 14.4 oz and costs $57). Ball heads are one of those things that you can spend a truckload of money on, and yes, that money will be worth it. Expensive ball heads are way nicer to use than cheap ones. However, in a small size like this, you aren’t really looking for anything other than a strong locking mechanism and a stable platform. It’s not like you are going to be tracking birds with your 400/2.8 while using the 1128/F-1 combo. The F-1 matches up well with other ball heads in it’s price range and gets the job done. The knobs lock securely and while the ball isn’t really “smooth” in the socket, that isn’t the kind of thing that you get at this price point and size. My one real issue is with the fact that someone decided that the tripod screw on the quick-release plate should be tightened with an allen wrench. Sure, they include an allen wrench with the tripod. But just how long do you think it’s going to take before that gets lost or forgotten? I would have much rather seen “use a coin to tighten” type of slotted screw. Thankfully, you can remove the allen screw easily and I would think a trip to a hardware or camera supply store would find you a suitable replacement. Despite that annoyance, overall, I would have no problem recommending the Flashpoint F-1 ball head to someone who was looking for a compact and light head on a budget. The first thing to understand about the Flashpoint 1128 is that it isn’t a Gitzo in quality or performance. But then again, it’s not priced like a Gitzo either. Buying the right photographic tools and balancing price/performance is all about clearly defining why you need a specific piece of equipment and how you are going to use it. If you are just going to use a tripod once a year to take the family portrait with a self timer, then by all means go spend $20 at the Meglomart and get a cheap-o one. It will work perfectly well for what you want to do. However, if what you want to do is use a 8×10 large format camera and try to be the next Ansel Adams, you might want to look into spending a couple hundred bucks to get the most solid and strong tripod you can find. Most of us fall somewhere in between. 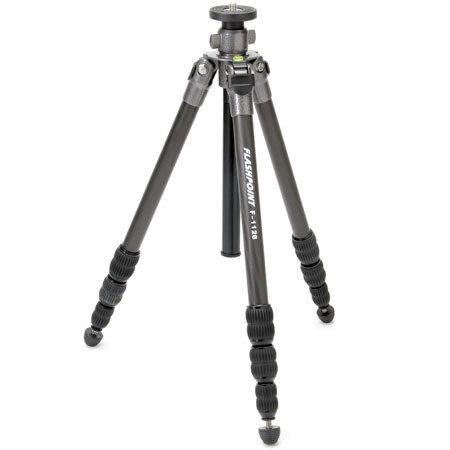 The Flashpoint 1128 is a fine tripod as long as you understand what it is meant to do. Within those limits, I would recommend it to anyone who was looking for a lightweight budget tripod. This is blatently a complete rip-off of the Gitzo 1128 - they even use the same model number! Well, no, it's not. For one thing. If these companies had actually violated any Gitzo patents, there would be no way that they could be sold in the US by a legit dealer like Adorama. For another, anyone who thinks that a $500 gitzo and a $150 CF tripod are the same thing in anything but looks is crazy. I have both tripods sitting here in front of me and I can tell you that they may have the same paint, but they aren't the same tripod at all. It's like saying that a Kia Rio and a Honda Accord are the same thing because they are both four door sedans. I make it pretty clear in the article that the Flashpoint isn't a Gitzo, and I would be very surprised if anyone came away with the idea that I was saying that it was. The Flashpoint is a decent lightweight tripod option for people on a budget, it is not a class-leading product. Recently bought a Flashpoint F-2 ball head. I find it to be a fine solution for a monopod but I would hesitate to use it for any heavy duty tripod work. For that, you are better off spending the money for a Markins or RRS product. The F-1 mentioned in the review above is even lighter duty than the F-2. I have a Really Right Stuff Versa 33 carbon fiber tripod, the creme de la creme of c.f. tripiods and I just bought a Flashpoint 1128 tripod. Why? Cause the Really Right Stuff, along with the BH-55 ballhead, is too heavy to travel overseas with. Having just come back from the Himalayas with it, I immediately set out to get lighter and the tripod and ballhead were numero uno on my list. And adding a monopod so my 70-200mm Nikon lens doesn't crush me under its considerable weight. I'm impressed with what I got for $133 in the Flashpoint. I'm not going to try and do 5 minute exposures in heavy wind at full extension, but I did get a very light, rich featured tripod that travels light. I added a Really Right Stuff UltraLight 25 ballhead and I'm in business. And a carrying case large enough to fit the tripod with ballhead, and for me to stuff my Slik monopod in as well? Sweet. This wouldn't be a primary choice for me to carry backcountry or do extended night photography with, the RRS is the bomb for that, but as a travel tripod I can shove in a backpack or carry on luggage, this is a great deal. For the price, I'm very happy with this tripod. Just picked it up used on craigslist and I got it at a heck of a good price. Had I paid retail, not sure that I would have been so happy.